Now here's a party favor that your guests will really love, and so will you! 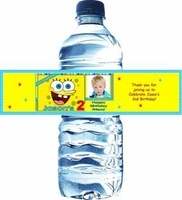 Not only are our Personalized water Bottle Labels a perfect "thank you", we can add a photo and customize your Water Bottle Labels FREE! Just imagine how awesome they will look on your tables! 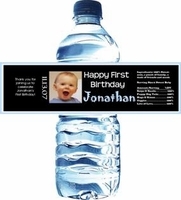 Choose one of our designs, or contact us and we will design a custom water bottle label for you free! We will also add a photo, logo, or special artwork to your labels, also free! Custom Water Bottles are great for indoor parties as well as backyard parties, pool parties, company picnics, and BBQ's. 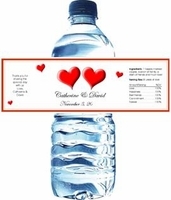 We have waterproof labels if your bottle are going on ice, or we have non waterproof water bottle labels if you just plan on putting them on your tables, or handing them out to your guests. 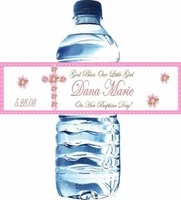 Our water bottle labels are perfect for any occasion. Great for Bridal Showers, Baby Showers, Birthdays, Graduations, Communions, or any occasion you can think of. 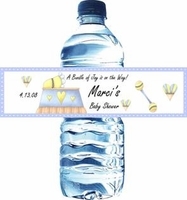 Feel free to email us at info@candyundercover.com or call us at 877-235-2828 if you have any questions, or would like us to customize a water bottle label for you.